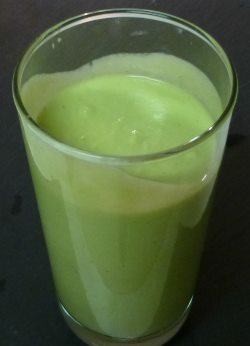 Combine lime with a cup of healthy milk, healthy fat containing avocado, spinach, and a few other ingredients and you’ve got one healthy dessert smoothie! I drank about half of this smoothie after dinner and made popsicles with the rest. Popsicles are another fun way to enjoy dessert (or any) smoothies. Enjoy! I’d love to know if you try this key lime pie smoothie and what you thought. Please leave a comment below. Happy Blending! Hey there fellow Michigander. Just wanted to say that the chocolate avocado smoothie is super delicious and creamy. I made it with my Vitamixer. Thanks for leaving a comment, Mary. Nice to hear you enjoyed the chocolate avocado smoothie. Hi,I am going to buy the ingredients for the key lime pie smoothie soon,and I will let you know how much I love and enjoy drinking your smoothie.